Please message me with questions at: aprilabbervig@1dad.net . 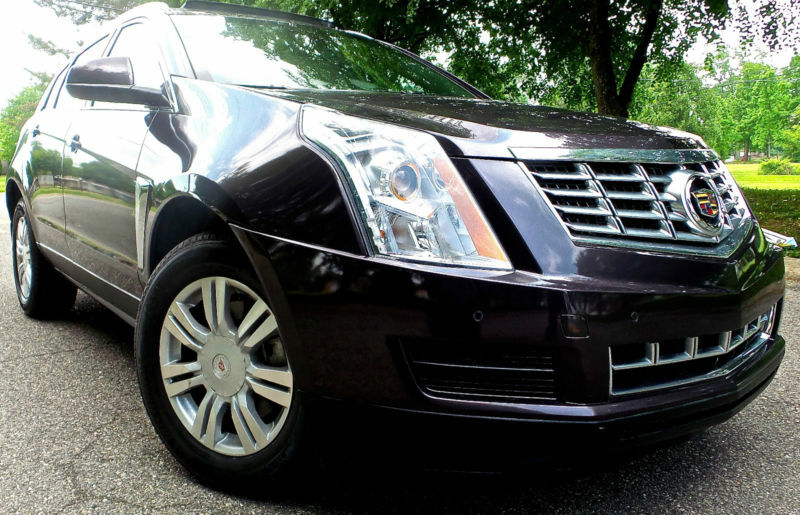 2015 CADILLAC SRX LUXURYA new Ebony/Ebony Accents interior color and with a new Majestic Plum Metallic 2015 Cadillac SRX Luxury Sport Utility in immaculate condition...3.6 Liter Direct Inject V6 engine with lots of power to boot !!!!! Only 10, 193 miles... ONSTAR NAVIGATION SYSTEM 3-D GPS color imaging with integrated Doppler weather and more, it’s your on-the-road control center ... Premium BOSE surround-sound audio system !!!! !Active noise cancellation is new for 2015 and helps create a quieter driving experience.....Side Blind Zone Alert and Rear Cross Traffic Alert... POWER HEATED SEATS !!!!! Power-folding mirrors.!!!!! REVERSE BACK UP CAMERA which displays live video feed of rear while vehicle is in reverse mode.!!!!! !.Factory Remote start built in.!!!!!! !.rear backup sensors which sound off an alarm when approaching an object while vehicle is in reverse mode...!!!! !.Premium BOSE audio system.!!. ULTRAVIEW SUNROOF which is pretty much an glass roof which has a gorgeous interior appeal !!. Am/fm/cd.! !.Heated power mirrors.! !.ONSTAR on demand.!!!!!! !.Ambient interior lighting.! !.Vehicle anti-theft.! !.Power steps pedals which you can accommodate to your preferred foot settings.!!!!! !.Dual zone automatic climate control.!!!! !.Rain sensing windshield wipers...Dual zone automatic climate control.!!!! !.Cruise control.!!!!! !.Steering wheel controls.!! SIDE BLIND ZONE ALERT Available Side Blind Zone Alert3 uses radar- equipped sensors that sweep the sides of the SRX. If your turn signal is activated and a vehicle enters one of your blind spots, an alert warns you of its presence. It’s like having an extra set of eyes so you can more safely change lanes. ULTRAVIEW SUNROOF The available UltraView sunroof is a perfect example of the thoughtful design featured throughout the SRX. With its large glass area that spans both front and rear seats, it gives the vehicle an even more spacious feel. When the sun gets more intense, a convenient power sunshade blocks the light and helps keep things cool. BOSE ACTIVE NOISE CANCELLATION This available technology uses three microphones to continuously monitor the sound inside the cabin and generate a cancellation signal to reduce unwanted low frequencies created by the engine and transmission for a remarkably quiet interior.